I should have known what was in store when Ted’s flight from Chicago was delayed by electrical problems. WDW46 was still 18 hours away and already we were falling behind. 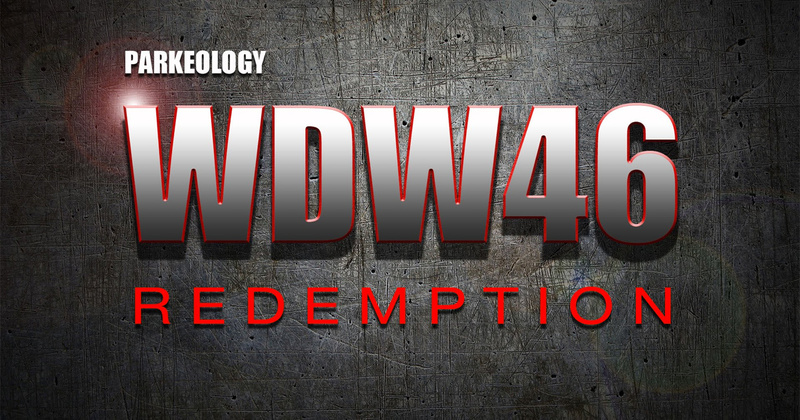 The planning for WDW46 began almost within days of completing WDW47 in the summer of 2013. We ended that run with 48 rides — 45 of them unique. Tomorrowland Speedway and Astro Orbiter were closed in the final hours due to weather and denying us the ultimate prize. Outwardly, we expressed satisfaction with the attempt. We had proven it could be done and came within a few raindrops of making it. But deep down, we felt that we left something unfinished. The day itself faded like a surreal, grueling dream. Then it was back to everyday life, with only sore muscles and broken bones to remind us what we had gone through. It seemed too much to hope that we could recapture the magic. It seemed unthinkable to risk coming up short again. But the idea continued to lurk in the back of our minds. And when FastPass+ came along and changed the game, another attempt became an almost certainty. We would try to conquer the mountain again. Picking the right day came with a lot of false starts. You need to have enough operating hours in the day, which means peak times of year. And you need all rides to be operational. After several aborted attempts (during which Ted literally had airline tickets in hand), we finally landed on Saturday, November 8th — the day after completion of a lengthy refurbishment of the Walt Disney World Railroad. When it came to the gear, we learned a lot from WDW47. We were much more prepared this time around, in terms of what we were wearing, what we were carrying, and how we were adapting. WDW47 was in June, which meant it started miserably hot, increased to unendurably hot, and then backed off to miserably hot again. WDW46 was November, which means it was chilly in the morning, warmed up into the 80s, then backed down into jacket territory again. We had a strategy for handling this. And the plan… Our vaunted, bulletproof plan. We had the ride schedules down cold. Knew every operating hour of every park and ride. We had mitigated every potential delay, had backup strategies for almost every park hop. But you know what that sound is? That’s God laughing as you make plans. It seems a little crazy, but we had a checklist for Friday night. There were obvious things like “Pick Ted Up From Airport.” But there were also some not so obvious things. We were paranoid about the Magic Bands, and made sure to validate that the admission media was loaded correctly. We had multi-day tickets linked to each band, just to make sure that a single-day couldn’t somehow pop up as invalid. The last thing we wanted was to be held up right at entry because of some ticket issue. We also double checked charging privileges, since our plan called for quickly purchasing bottles of water from outdoor vendors as needed. We had issues with the PIN numbers on Friday night, and had to get them reset, which didn’t instill a lot of faith in the bands. One of our park hops was by personal vehicle, so I actually timed the route — parking lot to parking lot — to verify that we would be able to complete the hop on time. I also had to make sure the car had gas. A “check engine” light had appeared on my dash earlier in the week. Another bad omen. While Ted spent the first part of his day dealing with the airport difficulties, I spent the morning at Epcot agonizing over our FastPass selections. We were holding Soarin’, of course. But our other two were Spaceship Earth and Mission Space. We were concerned that Journey Into Imagination might be a better choice. Its wait time had gone back and forth with Mission Space on the My Disney Experience app, but in the end we stuck with our original selections. After Ted landed, we checked into the All-Star Music Resort — seemingly every other hotel on property had been booked due to the Wine & Dine Half Marathon. We purchased breakfast items from the hotel food court and stored them in the mini-fridge, then had a light dinner at Epcot, conscious of not eating anything that might cause digestive issues on Saturday. Before bed we did a full gear check and a uniform fitting in the hotel. It sounds ridiculous, but we had a lot of stuff we needed to bring — everything from power bars to ponchos to a FitBit for tracking steps — and we really did not want to waste time with bag check lines. Our final task was to set two alarms for 6am: The regular hotel alarm clock and a safety wake-up call from Olaf. The last thing we needed was a late start. We never needed those alarms. I was awake by 5:30, too keyed up to sleep. I hopped in the shower and let Ted handle the Olaf call. He was not amused. Still stuck on Chicago time, I guess. We were out the door by 7:10, headed to Hollywood Studios. It was still in the 50s when we left the hotel, so we were both in jackets. The gates would open at 8am for Extra Magic Hours. Other guests were already in line, but we were only three back. We stood in the frigid morning air and waited for the gates to open. I suppose now is a good time to explain one of the basic tenets of the plan. It was really quite simple: Eliminate the longest lines. That meant accounting for the three biggest rides on property: Soarin’, Toy Story Mania, and the Seven Dwarfs Mine Train. It just so happens that there are only three ways to eliminate long lines: See it first, see it last, or use a FastPass. Since the new rules forbid holding FastPasses in multiple parks, we had to simply match the ride to the strategy. Magic Kingdom was open latest, so Mine Train would be last. Hollywood Studios opened earliest, so Toy Story would be first. That left Soarin’ with the FastPass. Text book. Our plan called for us to head to Toy Story immediately, followed by Tower of Terror and Rock ‘n’ Roller Coaster. With early morning crowds, we thought we could hit each of them in roughly eleven minute chunks. Then we planned to bail on Hollywood Studios and arrive at Magic Kingdom close to opening at 9am, where we would execute the same plan as last year — including the Main Street Vehicles (which are only open during the first hour of the day), big guns like Splash, Thunder, and Pan, and then rides that close early, like the Riverboat, Tom Sawyer Island, and the Railroad. It was a very tight schedule, and we were very worried about making it to Magic Kingdom by 9am. But at 7:53, Hollywood Studios began its Opening procedures and we were actually through the turnstiles by 7:55, a full five minutes early. Fresh-faced and ready to take on the World. We speed-walked up Hollywood Boulevard and quickly outdistanced everyone else. As we rounded the corner into Pixar Place, we were easily poised to be the first people on the ride — a huge savings right off the bat. We were euphoric, even wondering if the gains would potentially allow us to hit Star Tours during morning hours as well. We had executed perfectly. Then the door slammed in our face. We couldn’t believe it. Ted checked his watch. I reasoned that maybe because it wasn’t officially 8am, the ride hadn’t opened yet. We waited. Minutes ticked by. Crowds were moving in behind us, all of us annoyed that the biggest ride in the park was still shut down. We pleaded with Cast Members for information. We got nothing. We could see a maintenance worker opening up queue doors, which gave us hope. But the ride didn’t open. Ted’s watch closed in on 8:05. We debated for a few moments. The last thing we wanted to do was turn away and have the ride suddenly open behind us. And we knew from experience that if we left Toy Story alone, the line would build quickly. It seemed like the whole plan was ruined from the very first ride. Finally we drew a line in the sand. 8:10. If the ride hadn’t opened, we would just have to move on. We were very conscious of lines potentially growing at Tower and Rock ‘n’ Roller Coaster. We did have a return trip to the Studios planned for the evening, but knew that Toy Story — if it ever opened — would have an 80 minute wait by then, effectively destroying all hope. The clock hit 8:10. Ride still closed. In frustration, we bolted for Tower of Terror for the first ride of the day. There was no wait, and as we exited roughly ten minutes later, I checked the Disney mobile app. Toy Story was now up and running, with a line posted at 30 minutes. Knowing that it would only get longer, we skipped past Rock ‘n’ Roller Coaster and got in line. About 20 minutes later, we stepped onto the ride… Right about the time that we planned to be leaving Hollywood Studios. Eight minutes on the ride passed slowly, and by now we knew that being at MK opening was impossible. We could hop now, and pick up the plan from there, but the cost would likely mean having to pick up Rock ‘n’ Roller Coaster, Pan, Big Thunder, and Splash at a later time, with longer lines — All major rides. We decided to hit Rock ‘n’ Roller Coaster single rider, which took another ten minutes, but now Hollywood Studios was open to day guests. Knowing that Great Movie Ride could have one of the longer waits during our second Studios leg, and with all the Magic Kingdom big guns now out of the running for the morning, we decided to try the Great Movie Ride, which was posted at five minute wait. Inside, the line was much longer than advertised. We waited. Five minutes, ten minutes. We were approaching fifteen minutes when we realized that we were up against a threshold. The Main Street Vehicles were scheduled to close at 10:15. GMR is a 20 minute ride, and we still had a long park hop in front of us. We simply couldn’t afford to wait any longer or we would miss the Vehicles all together. We bailed on GMR and left the Studios in a foul mood, sprinting for our car. As we passed in front of the Sorcerer’s Hat, a voice called out. Someone had recognized us! We couldn’t stop but he gamely ran along beside us for a few steps, wishing us luck. It was our first bit of consolation to know that people were out there rooting for us. We jettisoned the jackets in the car and made a bee line to MK, where we hit early morning traffic heading through the toll plaza. But by 9:45, we were through the MK turnstiles, with a Horse Car parked directly in front of the Railroad Station, almost as if they were holding it for us. As we approached and were about to board, we were told by a brusque driver to “Stand back.” In disbelief, we watched as they unhitched the horse, turned it around, and casually rehitched it to the rear of the vehicle. A moment later, the trolley was rolling off backstage, heading into the barn. We tracked down a lead, who explained that they were done, since the parade was about to start. After much questioning, she finally realized what we were asking, and confirmed that the rest of the vehicles were completely done for the day, but the horse cars would be out again around 10:45 to 11:25. Not sure whether to believe her, we headed into Adventureland. At this point, we were a full hour behind schedule, with the two most critical rides of the morning causing the biggest trouble. We had ridden Toy Story at great cost, but we were not at all confident the Vehicles would return. But what choice did we have? We soldiered on. We had been monitoring the weather forecast all week, and by the day of the run, we knew there was a 95% chance of rain in the evening. Filled with a sense of impending doom from last year’s run, we had resolved to knock off outdoor rides when we could. So when we saw Magic Carpets in front of us with no wait, we took it and completed ride #4. Then we caught our first break of the day. Big Thunder was at 30 minutes, but Splash was still only at 5, so we hopped on board. Upon exiting Splash Mountain, another group was waiting, this time with custom signs. That put a spring in our step — almost as much as the sight of a train sitting in the Frontierland Station. We raced up the steps… and they had already finished loading. With a nearly audible whoosh, the wind came out of our sails. In retrospect, seeing a train at all was a good thing. The Railroad had been down for several months for a long refurbishment, and had only reopened that day. We had been very concerned that the opening might be delayed. Five minutes later, another train came along and we were on our way to Storybook Circus. Ride #6. The plan was to knock out both Dumbo and Barnstormer, as we had done last year, since both of them were outdoor rides which might close in a storm. But by now, they both posted 20 minute waits and we knew the lines would be much shorter during Evening Magic Hours, assuming the rain didn’t K-O them first. We took a risk, bypassed them, and caught another break. The Tomorrowland Speedway was posted 15 minutes, but the line looked much shorter to us. We were on in 5. Ride #7. As we came off the ride, we heard cheering from the Grandstand. Another group had found us! We believe that this is the only time in Walt Disney World history that the Speedway grandstand has been used for actual cheering. Buoyed by their encouragement, we headed for Main Street, where we hoped the Vehicles would once again be up and running. The first Cast Member we talked to told us they were done for the day. This of course was a bad sign, but as Ted reasoned, it’s often easier for people to just say “no” than it is to be helpful. We could see the horse car parked in front of the Railroad Station again, a background prop to one of those Main Street song-and-dance shows. We found Benjamin, who looked like a lead or a manager. 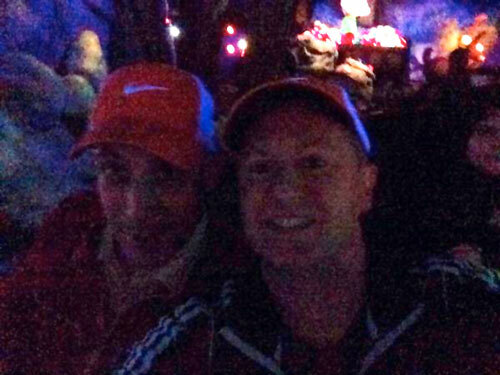 He was able to confirm that when the show ended, the trolley would be operating again for a few minutes. Relieved, we waited impatiently while the Main Street performers rounded up their props and finally we were clip-clopping our way back towards the Hub. Another couple shouted out encouragement as we went past. We could not believe the number of people that had tracked us down just to give us a few cheers. We spent the entire 20 minute trip on one of the internal benches, eating a power bar while using the mobile app to change our FastPass time for Spaceship Earth. At 11:50 we were off the boat and quickly made our way to the Tom Sawyer Island dock. We took the obligatory trip across the river and back, then it was onto Epcot. The Epcot parking lot was a sea of cars. They were crammed into every available square inch of surface, like an overflowing battlefield hospital. Cars were parked on every grassy knoll, lined up parallel along roadways, some of them nosed halfway down into the ditches. As we cautiously approached the bag check area, we could see lines at every ticket turnstile, snaking not only down to the monorail station, but then doubling back on themselves all the way up to the window again. The last weekend of Food and Wine Festival is no joke, people. That sucker is crowded. We were already in the FastPass window for Mission Space so we headed there first. To our surprise, there was not a single person in line for the Green Team. The crowds, it seemed, had flocked to World Showcase. We knocked off Ride #12 and headed to Test Track. This ride is notorious for breaking down, and had actually been offline during our first Epcot leg last year. Our constant worry about the weather drove us into the single rider line in spite of the posted 30 minute wait line. Again we caught another break. We were on Test Track in 15 minutes. By now we were realizing that Epcot might help us gain some ground. It was jam packet, but apparently people were more interested in standing in line for food booths than rides. We were still an hour off schedule, but as Ted said, we would have to make it up 2 minutes at a time. We hustled into Mexico for our only foray into World Showcase. Fortunately we didn’t have to go far. World Showcase was body-to-body. Once inside the pavilion, we saw the line for Gran Fiesta Tour snaking out into the shopping area. Fortunately, they hadn’t opened most of the limited queuing space. We also encountered another reader who offered us more encouragement and even waited in line with us (she also caught up with us later at the Land). We polished off Ride #14 and escaped World Showcase. Journey Into Imagination was a virtual walk-on. Always be alert for the Cast Member asking for parties of 2 — this saved us a precious minute or two several times throughout the day. By then it was time for our Soarin’ FastPass. While certainly better than the posted 80 minute wait, we still waited 20 minutes before finally setting flight. Living with the Land was posted at 15, but it only took five. Ride #17. Next came Nemo, with basically no wait, and our FastPass for Spaceship Earth (Rides 18 and 19). Then came the longest 40 minutes on earth. Ellen’s Energy Adventure. We used the time to stretch and eat another snack. Epcot, with its vast assortment of long, leisurely rides, is like driving through Texas. You feel like it will never end. But we had polished off our first park and the sky was turning cloudy. Time for another park hop. We had two concerns heading into Animal Kingdom. First, we knew that the Safari closed earlier than the rest of the park, with the last ride scheduled for 4:45. We were also concerned about weather, with the outdoor coasters. We paused to snag a FastPass for Kali on our way in, which had a 20 minute wait at the time and had been our longest AK wait last year. FastPass+ allows you to use a kiosk to pick up FastPasses one at a time after you have spent your first three, and this is the point at which you can also start picking them up in different parks. As we came off Safari, we got cheers from two more groups — one of which happened to be my sister and parents. They rode the Wildlife Express with us on a grand circle tour to Conservation Station. Ride #22. By then it was time for our Kali FastPasses. We donned the cheapest ponchos in history which Ted had found at a dollar store. They protected very little, but fortunately with the colder weather, most of the Kali water effects were turned off. We also walked straight on, the FastPasses proving useless. This was ride #23 — the halfway point. But the day had been front-loaded with long rides like the Safari, Energy, and the Land. We still had a few long rides to go, but also several short rides at Magic Kingdom waiting for us on the back nine. We headed next for Everest, but it still said 30 minutes. It was getting dark by now, and we thought most people would be leaving Animal Kingdom. We elected to bypass Everest and head for Dinoland. Primeval Whirl was only a five minute wait, and TriceraTop Spin had no wait. Rides 24 and 25. We next rode Dinosaur (again with no wait), and our suspicions had proved correct. We only waited a few minutes for Everest. 27 rides down. 2 parks complete. A light mist was in the air as we cruised into Hollywood Studios. The Wine and Dine Half Marathon weighed heavily on our minds. The park was set to close by 8pm to prep for the race — and with it, a series of road closures throughout property, which we feared might severely delay our park hop to Magic Kingdom. Fortunately we only had two rides remaining, having solved the big guns during Morning Magic Hours. As a protection against possible delays, we hit the shorter ride first, walking onto Star Tours as soon as soon as we entered the park. That left Great Movie Ride, which we had already wasted ten minutes on early on the morning. GMR was one of the longest rides on our list, and if we tacked a long wait time on top of it, we would be sure to run into the road closures. Maybe it was the light rain, maybe it was the cooler weather. Maybe all the marathoners were heading to their race. But GMR had only a 5 minute wait. We polished off ride 29 and headed for the parking lot with 20 minutes to spare. We experienced momentary panic as transportation was delayed due to the hordes heading for the marathon, but it ended up costing us only another five minutes. Traffic was slow as we waited an eternity for the traffic lights, and by the time we were heading north on World Drive towards Magic Kingdom, the mist had turned into a steady rain. Deja vu all over again. We were coming up the path to Magic Kingdom with darkness at our backs and rainclouds in the sky. Success was still on the table and mathematically possible. The only difference from last year was the damp chill in the air. Visions of closed rides danced in our heads. We were actually rolling into MK about an hour earlier than last year — but in worse shape. Still in front of us were all the big rides we missed in the morning: Big Thunder, Peter Pan, Dumbo, Barnstormer. As well as the thousand pound gorilla in the room, the Seven Dwarfs Mine Train. We figured those five rides alone would quickly devour that extra hour as an appetizer and then start munching on the remaining time as the main course. We were also staring straight into the face of a whole bunch of potential closures due to weather — including four of the previously mentioned rides, but also Astro Orbiter (our nemesis from last year). With the Kingdom still packed to the gills, we wanted to be hitting long rides with short waits such as Carousel of Progress and the PeopleMover. But by now we had developed full-on ombrophobia: fear of rain. Outdoor rides became the priority. The first order of business, however, was to stop by a FastPass+ kiosk to see if we could turn something to our advantage. It was after 8pm, with another three hours of regular park time available, so we weren’t expecting much. We had a priority list of rides, which started with Space Mountain (a pipe dream), and worked backwards to something like Dumbo. We ended up with something in the middle: Jungle Cruise. With our FastPasses coming due in approximately 20 minutes, we made a quick pass through Tomorrowland to check the Orbiter, which had a posted 35 minute wait. We shelved it for later and went for Storybook Circus. It was still drizzling, so we waited only about 5 minutes for Dumbo. Ride 30. Barnstormer looked to be about ten minutes so we took a quick bathroom break and headed for the entrance — only to have them shut down the ride right in front of us. This was the third ride that day to close just as we were trying to ride it. Our luck, it seemed, had not improved. We slogged all the way back to Adventureland for our Jungle Cruise FastPass, where we bypassed the 15-20 minute line and hopped onto a boat. Ted was treated to a rather horrific rendition of the Jingle Cruise script, but we now had ride 31 under our belts. With a kiosk right outside Jungle Cruise, we went for another FastPass. We couldn’t believe our eyes when availability for Space Mountain popped up on the screen. We tried to snag it, but it evaporated before our eyes. We had to settle for Barnstormer. We made a beeline for Pirates, since we wanted to avoid backtracking and we desperately didn’t want to be trapped in Adventureland when the Main Street Electrical Parade started up at 9pm. But Pirates was queueing outdoors, posted at 35 minutes. FastPass+ was inflating lines everywhere. We skipped past it and crossed the parade route to Big Thunder Mountain. The sign said 30 minutes, which would be very detrimental to our cause — especially with those long Tomorrowland rides that were available with no wait. But Big Thunder was a critical E-ticket and an outdoor ride to boot. We decided to spend the time on the line and were rewarded when the wait was only about 15 minutes. Ride 32. By then our FastPass window for Barnstormer had opened up, and we bypassed a short 10 minute line to walk right on. Ride 33. The rain had increased by the time we were off the ride. We made another play for AstroOrbiter. The rockets were still circling, but the rain and parade had shortened the line down to 15 minutes. We shaved another 5 when the CastMember began looking for parties of 2 or 1 and we alertly agreed to ride in the same rocket. Side note: Something you may not know about AstroOrbiter… The mechanism is not designed to lift two grown men in the same rocket — nor are two grown men designed to fit in the rocket. By now we had come too far to let a bit of uncomfortableness get in the way of defeating the Orbiter, so we crammed ourselves into that tin can and listened as the hydraulics groaned and strained like a bodybuilder who has done one too many sets. We might still fail, but it would not be because of the AstroOrbiter. Ride 34. By now we had mitigated all outdoor rides except the Mine Train. There was nothing we could do about that one, since it was still at 80 minutes. We set our sights on another obstacle: The 11pm close time for non-resort guests. 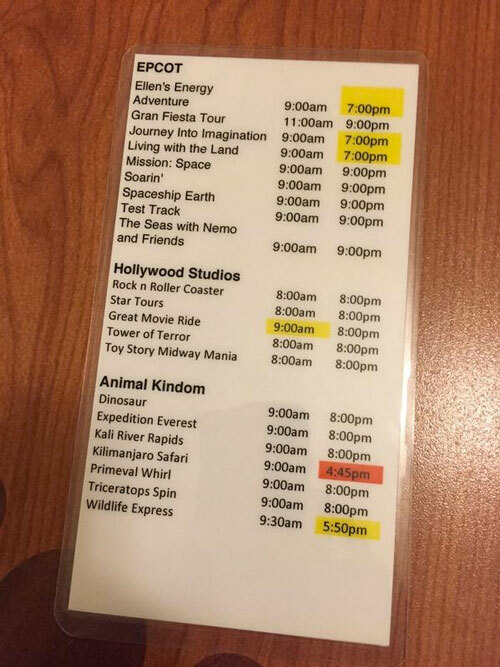 We would still have Extra Magic Hours until 1am, but not every ride is open during Extra Magic Hours. Namely: The PeopleMover and Carousel of Progress. We knocked them off in quick succession — well, not exactly quick, since they both feel painfully long. But without waiting. By 10:30, we were also off the Tea Cups, powering through while waiting only one ride cycle (and fuming at the five empty tea cups that the Cast Members had prevented us from boarding). 37 rides down. With 2.5 hours of park time remaining, we had 9 rides in front of us. It would require a pace of about 2 rides every half hour. We did some quick math: Pirates, Mansion, and Small World were all longer rides. Space Mountain, Peter Pan, and Mine Train were short rides but had enormous wait times. Our calculations still had us coming up about 2 rides short. But we could quickly knock off Little Mermaid with no wait. Ride 38. We figured we could always hop onto one of the long wait time rides right before closing, which had been our plan for Mine Train all along. But we were going to have to wait for either Pan or Space. We decided to just get Space Mountain over with. The wait time was posted at 30 minutes. We hopped into line. It moved slowly at first, but it helped that the park officially closed to day guests at 11, and FastPass ended for the day. We were on the ride after about 20 minutes, and even saved a couple rocket cycles by offering to not sit together so that we could fill empty seats. It felt good to get ride 39 off our backs. Then it was on to Buzz Lightyear, ride 40, and neither of us bothered to fire the gun even once. As we rode, we did the math again, still coming up about 15 minutes short. The rain was coming down harder as we exited Buzz, and somehow summoned the strength for a mad dash across the park to Adventureland, where we zipped through the empty queue and just beat the pneumatic gates into the last row of a Pirate boat. We had covered the park distance in a bare two minutes, and suddenly we had life. If we could polish off Pirates, Mansion, Small World, and Pooh, then catch a break with the Peter Pan line, we figured we would be right down to the wire with a shot at Mine Train. Suddenly victory seemed just a lucky bounce away. As we passed through the opening caverns, drifting over the shadows of mermaids, our boat came to a dead stop. We squinted into the darkness of Hurricane Harbor up ahead and counted eight boats stacked at the drop. We looked behind us. Ours was the last boat. Had something gone wrong? The caverns lit up like Christmas at the Griswolds. We still had no clue what the hold-up was. Had rhinos wandered into Pirates from the Safari? All we could do was sit there and watch the seconds tick by. We knew what time we had planned to be off the ride, but that milestone was long past. Now we were approaching the time by which we figured to be done with Haunted Mansion. And still we hadn’t moved. Finally the work lights went back off and show audio resumed. Then slowly, boats began disappearing over the falls. Ride 41 had driven a nail into the coffin. By the time we exited, we were certain that we would end our run still standing in line for Peter Pan, with the Mine Train untouched in the darkness of Fantasyland. We were surprised to see a group waiting for us in the Pirates gift shop, cheering and hollering as we came through. It gave us just the burst of energy we needed to charge hard for Haunted Mansion. Using every trick at our disposal (meaning, actually listening to the Cast Members when they tell you to fill in all the available space in front of you and positioning ourselves in the Stretch Room so we could be the first ones out), we managed to knock off Mansion without any delays. Then we took the shortcut past the Tangled bathrooms and hopped on It’s a Small World. Ride 43. This was three 10+ minute rides back-to-back-to-back. It gave me a lot of time for prayer. God has a lot more important things on His plate, but we needed help. As we came off the ride, I could see my sister at the top of the ramp. She had found us in Magic Kingdom. 12:14 a.m. Hopped onto Peter Pan. Ride 44. 12:22 a.m. Hopped onto Winnie the Pooh. Ride 45 (matching the unique total from last year). 12:29 a.m. In line for Seven Dwarfs Mine Train. Neither one of us was ready to celebrate. The Mine Train line wasn’t a walk-on, but at least it was moving at a brisk pace. The way things had gone all day, we half expected the ride to burst into flames just as the gates opened, in spite of the drenching rain. But a train rolled into station and we sat down quickly, not saying a word. Waited as Cast Members performed their final lap bar checks. Watched them give the all-clear to dispatch. The brakes hissed and the train eased out of the station. In case you can’t tell, that’s a diamond mine behind us. By the time we hit the hills, we were shouting and high-fiving. This was Ted’s first time on the Mine Train, and I’m not sure how much he was even aware of it. As ride 46 ended and we waited to pull into the unload station, we realized that it was only 12:40. We still had 20 minutes of park time. When we first concocted our plan, we expected the Mine Train to be the last ride of the night if everything went our way. And when we got off to such a horrendous start, we were only focused on clawing our way back to respectability. We had nothing prepared for what we would do if we actually finished. We had proved that WDW46 could be done. Do we simply stop? On the other hand, we had actually seen 48 rides last year (45 unique), so we felt that there was something to be said for matching the ride count. So we went back and rode Winnie the Pooh again, followed by Peter Pan. With nine minutes to go before the park closed, we thought: Why not try for Fifty? We hopped on the Prince Charming Regal Carousel (hey, it’s short), and then we were back in line for the Seven Dwarfs Mine Train just a couple minutes before 1am. Just as we always planned it. In the course of a single operating day, we had ridden every ride at Walt Disney World, and had a grand total of 50 rides under our belt. And the reality is that if everything had gone according to plan, we might have had time to hit 60. We exited the Magic Kingdom on an empty Main Street, with the Castle Dreamlights glowing in the mist behind us. Physically exhausted, mentally spent, but very happy with how things had turned out. We had not only survived all the curveballs, but we had actually exceeded our original expectations. Last year we had proved it was possible. This year, we actually did it — in spite of all the inflated lines from FastPass+, driving rainstorms, marathon crowds, Epcot hordes, four ride closures, and a transportation delay. Through it all, everyone watching and rooting for us on Twitter and in the parks was a constant source of encouragement. We cannot thank you enough. You guys are the absolute best. “Why climb Mount Everest?” pioneering mountaineer George Mallory was once asked. “Because it’s there,” he brashly replied. This entry was posted in Theme Park Life and tagged wdw46. Bookmark the permalink. Ha! Trust us, nobody wants to see us in SparkleSkirts. We tríed this yesterday, but ended our count at 37 rides. Crowds were still high due to the holidays and a DInousar closure that delayed us for more than an hour in Animal Kingdom killed our goal. We have a newfound respect for this challenge and what you guys accomplished as there are two many variables playing out that could make or ruin an attempt. We will try it one more time next year because my ego was hurt, as an ex VIP tour guide for WDW I tought I knew the parks and wait times like the back of my hand, it seems that I could have planned better!!! There is a ton at play. Weather, crowds, closures, delays etc. You need a plan and back up plans and you need to understand how all the pieces fit together. Dropping even one ir two rides makes it much simpler. The other huge variable are the park hours. Obviously the longer the hours the easier it becomes; the shorter the hours the more impressive the accomplishment. Awesome job!! Your next challenge should be to complete one park – all rides, all parades, all shows. I’ve actually done this many times, showing friends around. We completed all of Epcot (all those World Showcase movies, Illuminations, etc.) on New Year’s Day. It sounds difficult, but if you’re willing to simply show up at opening and go until close, it’s actually a breeze. Man, I wish I had known this was going on, as we were there at the time and would have cheered you on! Glad to hear it was a success! If you attempt this in the future again, to avoid the parking fiasco at Epcot, I was informed that the parking issue was related to the fact that all participants in the Wine & Dine Half Marathon (which finished at Epcot – starting from ESPN Wide World of Sports at 10:00 pm – yes, PM) were allowed to park for free at Epcot that day so their vehicles would be there for them when they finished. I began to tense up just reading this. Incredibly suspenseful! Maybe next time you could try it with 2 toddlers in tow. Now that’s a challenge. Congrats, guys! You really make me wanna schedule a trip just to try and conquer it! You should think of putting together a book — maybe call it “Parkeology Presents Famed Naturalist John Muir’s Challenge Guide to Conquering Walt Disney World”. Since you beat WDW46. Have you thought about adding the attractions with animatronics to the attraction roster? You know Stephen lots of others are attempting it and that’s great. We would love to see you and everyone succeed. But you know how it goes, there can only be one first. We laid it out, we showed how to beat it… Now go have fun! Exactly! You guys paved the way and scaled the peak first (figuratively of course) – and thank you for taking all of us readers along for the ride with such a great, descriptive article (and upcoming video). It’s beautiful – bully beautiful! BEST RECAP EVA!!! 🙂 i was so excited for you both that you were taking another go at it. I actually stayed away from Twitter and kept my fingers crossed all day because I was just to nervous for you guys! Even knowing you finished, I got all anxious reading your account of the events. Awesome job guys! The Sum of All Thrills is a ride no? The 24 hour thing is of course extremely simple and thus of little interest to us. Go read the WDW47 FAQ to understand why no, Disney does not consider Sum of all Fears a ride. It in neither a stand alone attraction or owned and operated by Disney. Thanks for the excellent “minutes” of your day, it was thrilling to feel like I was experiencing everything with you. They should put a statue of the two of you similar to the “Walt and Mickey” statue somewhere in the parks… perhaps the gas station (kidding!). One thing I was wondering was how you dressed– I imagine the two of you as wearing serious cargo pants stuffed full of all your ponchos, snacks, ride charts, car keys, extra batteries, and whatever else you hauled around with you. Thank goodness that WDW doesn’t have any rides (as yet, anyway) that force you to rent a locker if you have anything that could potentially fall from a pocket. Cargo shorts were a part of the mix for sure. This year we managed all our stuff much better than last year. Just curious on how many steps and miles you took to accomplish this? I know you said you wore a fitbit, but didn’t mention it at the end. Do you have a count? You must have missed the tweets Adam… we did post it and it seems to be one of the things people are most interested in. We have over 44,000 steps and with our running strides that equals 20 – 22 miles. Thanks! That’s impressive. Headed to do a slightly less impressive feat next week… The Epcot Beer Tour. Super huge congratulations, and thanks for sharing the play-by-play! Did you intentionally eliminate the on-foot park hops from last year, or did the plan form that way organically? Obviously, it’s a monumental physical challenge either way, but I can’t imagine walking/running/hobbling from DHS to Epcot on top of everything else. You guys are amazing. There were actually TWO on foot hops between Epcot and DHS last year… thankfully the way the park hours broke down this year we were able to avoid BOTH of them… and yes that was very much planned for from square one. Having those out of the picture not only saved us two miles of hobbling but also precious time needed to deal with the new lines formed by FP+. last year was wonderful, this year was just fabulous. This is like my Super Bowl. I hope you go for it again next year, I will be here rooting you on. Well done!! Ha! Thanks Heather. We love that people get a kick out of it. 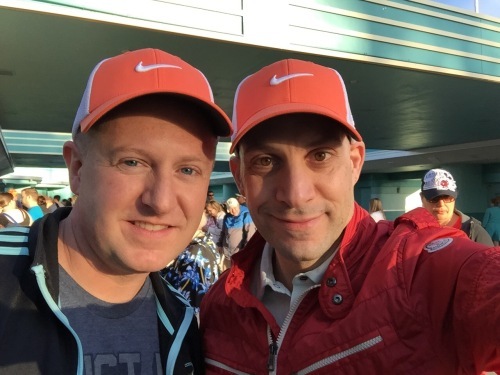 I like that Heather, these Parkeology ride events are way more entertaining, suspenseful, and meaningful than any sporting event, and I can’t think of two nicer guys to root for. However, there is a part of me that hopes that they NEVER try this AGAIN– it is so stressful and hard on the body! They already proved themselves and they should be able to look back on their success and revel in it. I agree with your comment about never trying it again. Now that it’s been done, what would be the point? The result would either be disappointing or anticlimatic. Boys, I think you should come up with another challenge, like seeing all the shows in one day, or seeing how many meet-n-greets you can get through. We have some ideas JD! It’s funny, many have been inspired to try it and there are even a few flat out copy cats. We are glad to have invented it and laid out how to do it. If others want to jump on the bandwagon we say welcome aboard. After all imitation is the sincerest form of flattery. For us… What’s the point? Add a few more rides? Up the total? Who cares; we have been there and done that. But you just never know what we may have up out sleeves! How about a competitive eating challenge? Well, in a manner, that is. Purchase an item of food from every map listed food vendor/restaurant in all four parks. Now that would be an interesting nightmare. I’m so sad I didn’t know this was happening or I would’ve cheered you on when I got off of work! I work right next door to Pirates, and the first thing I thought when I started this was “if anything gets them, it might be that one.” It’s been going down almost daily the past month or so, sometimes for hours at a time. Glad that it didn’t end up slowing you down too much. I might have to attempt this, now that you guys have found a way to work with FP+! We could have used your insight Kat! Can we expect a WDW 46 video this time? Yes… but honestly not for a while… I’m super bust at the moment but we will get one out there for sure. I am amazed to see that you pulled this off. I was there on Saturday and was trying to see if I could pull this off as well. I did not come anywhere close to what you guys did. Me and my partner had significant delays, especially when we had my partner’s 6 year old daughter in tow. We started at the Magic Kingdom and when we arrived at about 9:20 and saw that the Trolley had a stage show and the other Main Street vehicles were already pulling backstage we knew we werent going to make all the attractions. We still tried, but the crowds at Animal Kingdom were just too much and destroyed the rest of our plans. Overall, we hit about 25 rides across 4 parks. At MK we were at the Barnstormer when it was 101, about 3 minutes after you were and while I didnt see you guys, it was highly likely we might have been on the same Dumbo ride. I think your next challenge should be to pull this off without the extra magic hours and to make it extra challenging take along a small child. When we ran WDW47 last year my wife and then 8 year old daughter ran MK 24 concurrently. Meaning they achieved riding all the rides at the MK in one day and had time to take a break mid day at the pool. It is a much more difficult challenge then one might think… it is actually somewhat easy to get say 43 rides… if you remove just one or two key ones everything sort of falls into place… but having to do ALL of the rides changes things quite a bit. 25 rides with a small child actually seems like a good number. It might actually be some sort of child abuse to put them through what we did. Trying it without extra magic hours seems impossible at first glimpse — but under the right circumstances, I can think of a few scenarios where it might be doable (or at least close). The missus and I are planning on making an attempt possibly next year. That’s awesome. We wish you the best of luck — just be prepared that it is a LOT of walking/running. If the write-up doesn’t scare you away, then you can probably handle it. Just curious how many steps were logged on your FitBit? I am in awe of you guys, congrats! Over 44,000 steps or somewhere over 20 miles of running throughout the day. Well done! Loved the write-up and following you guys on twitter. What an amazing accomplishment! It felt good to finish this one for sure. And feels even greater to know other people got enjoyment out of it as well. Well done. I wasn’t able to follow you live this year but I enjoyed reading all the tweets later and finally this great recap. If I remember correctly, you used taxis exclusively for park hops last year. Did you use them at all this year or did you drive yourself? Just curious: if/when you drove to MK, where did you park? Actually last year we had at least 2 park hops that were on foot, and one that was by car. One of our park hops this year was by car as well, but we were very thankful to eliminate the walking between Epcot and Studios. I like to say that the actual run is equal parts art and science. There’s definitely a logical side to it trying to make all the puzzle pieces fit. But you have to be able to adapt on the fly. This makes me tired AND excited for you guys at the same time. IM SO GLAD YOU DID IT. We need to have you on the show to talk about it. We would be happy to come on! You know we are huge fans of the show. Let me know what your schedule looks like. Next challenge: attempt to ride every ride in one day and chug a beer after each ride. That would be entertaining to watch two drunk dudes riding the teacups. The goal would be not so much to finish as it is to see how far you can get before passing out. I was close to passing out at Ellen’s Energy Adventure. Does that count for something? So pumped! I enjoyed following the progress all day and was with you in spirit. Late that night (after an insane come from behind Overtime victory for my Crimson Tide) I read your “Victory” tweet and threw both arms in the air as I lay in bed. Namaste! Thanks for the support, Ben! Nothing like taking down LSU — I mean, all the rides at WDW in a single day! Loved the recap! I hope to someday take a shot at this type of adventure. It sounds exhausting but great fun. I’m impressed that it worked out despite all the delays. With FP+ slowing everything down, it’s pretty amazing that it worked. It was loads of fun but also very difficult physically and mentally. Our spirits really did get crushed pretty early on, and then it seemed like we couldn’t ever catch up until finally right at the end, all of a sudden we had it. Followed you guys on twitter last year and this year. What a great plan and execution. I can’t imagine the conversations you had on rides while you waited and plotted if you would make it. Can’t wait till next time! After the Toy Story and GMR fiascos in the first hour, we decided to just be decisive, even if it might not be the perfect move “in the moment.” We really felt like there was not any time for debate. Our discussions in line and on rides usually were just to reiterate the next step, and the cleanest, fastest way to get from point to point, as well as to discuss an alternate move if we got there and the line was too long. We had our master plan down cold, but during execution, but we were tactically making changes on the fly. We ended up criss-crossing within a park a lot more than we wanted to, but it was done solely to minimize standing in line.